I quickly fell in love with old town Krakow as I walked under the arch of the wall that led to Rynek Glówny, the Main Square. Enchanted by anything old-world and medieval, Krakow had me at every turn. There was the magnificent cathedral, the imposing city wall, and of course the castle on the hill off in the distance. It was like a fairy-tale, and being a total sucker for that type of thing, I was completely taken as I wandered the streets. Amidst the local artists showcasing their work, street performers, and women selling pretzels from street stands, were endless shops of amber, silver, and other Polish goods. Spotting a nice looking jewelry store, I ducked inside searching for the one thing I buy myself from every place I visit: a silver charm for my travel bracelet. When I told the woman what I was looking for she pulled out a tray. “I have the perfect one.” she told me, quickly sorting through a variety of silver pieces. I expected her to show me a miniature of Wawel Castle, or St. Mary’s Basilica, maybe even a coat of arms or a flag. But when I saw what she had in mind for me, I was more than a little confused. “Yes the Krakow dragon!” she told me excitedly, don’t you know the story? Clearly I didn’t so she kindly explained. According to legend, during medieval times a big and ferocious monster known as the Krakow dragon lived in a cave at the base of Wawel hill. The Krakow dragon was a menace, and terrorized the locals; tramping daily through the town killing anything and everything in its path. It would eat, not only the livestock, but the people as well; especially fair young maidens. In an effort to appease the monster the locals took to leaving a young woman outside of the dragon’s cave once a month, and although this tactic seemed to work for a while, the town soon ran out of fair maidens. Except for one; the king’s daughter. Not wanting to sacrifice his own daughter, the king sent a number of his bravest knights to slay the beast, but they all lost their lives to the dragon’s fiery breath. In desperation, the king called upon the heroes and warriors of the land, begging them to slay the fierce dragon in exchange for his daughter’s hand in marriage. As expected, such an attractive proposal drew brave men from all over; however like the king’s knights, none of them could survive the Krakow dragon’s fire. One day a local boy, a cobbler’s apprentice by the name of Skuba, decided to try to take on the dragon for himself. Having watched so many knights and heroes die trying to battle the Krakow dragon, he knew he needed to take a different approach. 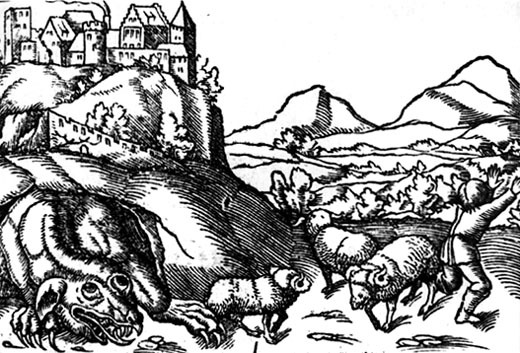 Skuba stuffed a lamb full of sulphur and left it outside the Krakow dragon’s cave. As expected, the dragon made quick work of eating the lamb but became incredibly thirsty. In an effort to quench his thirst the dragon went down to the Vistula River where he drank, and drank, and drank. But he was still thirsty, so the dragon continued to drink from the river until it was half empty. But by this time he was so full that he exploded, leaving Skuba to claim his prize and wed the king’s daughter. And, of course, they lived happily ever after. Enthralled by her tale, I thanked the woman and quickly purchased the Krakow dragon charm to add to my bracelet. “Don’t forget to visit the dragon and his cave yourself!” she told me as I packed up my things to leave the store. I quickly assured her I would, although I wasn’t sure what to expect (didn’t the dragon explode?) there was no way I was leaving Krakow without seeing this famous tribute to the local legend. It was a couple of hours later when I finally got my chance. I had taken a free city tour and it ended at Wawel palace where our guide also shared with us the legend of the Krakow dragon. 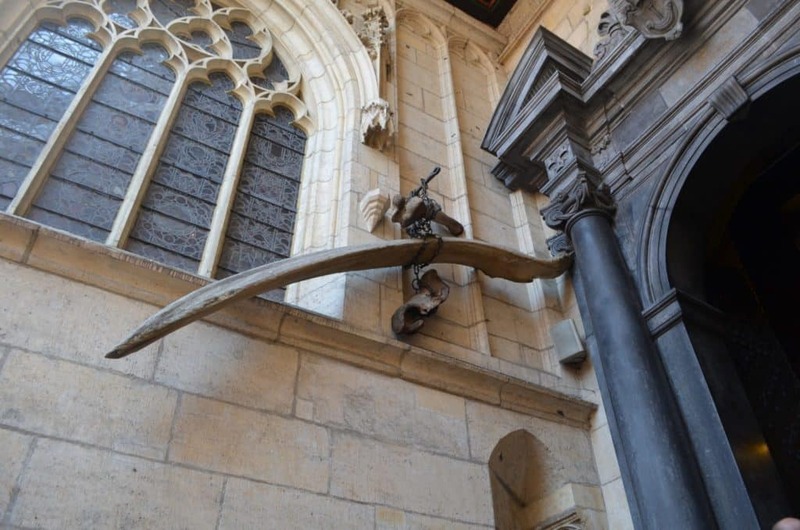 Then, at the cathdral, she showed us the Krakow dragon’s bone on display beside the entry way. As the tour broke up I asked where I could find the Krakow Dragon. With a grin she pointed myself and a fellow tourist form Australia down the hill. I heard the Krakow dragon before I saw it. A big WHOOSH came out of nowhere quickly followed by the laughter and screams of delight from younger children. Rounding the corner we saw the main attraction; a sculpture of a rearing dragon that periodically breathed fire. And behind him, a large cave that burrowed underneath the hill of Wawel Castle. Mission complete- we had found the Krakow dragon! Thankfully, it was a little friendlier than the original, and instead of trying to slay it with weapons (or sulphur stuffed sheep) we got to play tourist and take numerous perfectly-timed photos of the monster and his fiery breath. What a fun story. I, like you, love when a place makes me feel like I’m in a fairy tale. I always enjoy your Eastern Europe posts – never been unfortunately (which is why I like your posts so much about the region!) Krakow seems amazing – and also very affordable from what I hear! Thanks Alli- kinda how I feel about your SE Asia posts! One day we will both get everywhere 😉 Yes Krakow is fantastic and very affordable which is a huge perk! Love this post! You have a real skillful way of writing articles – This makes me want to visit Krakow even more, can’t believe I opted out of going there this year! Aw thanks for the kind words Paul 🙂 You’ll just have to plan another trip to visit- it’s one of my favourite cities! 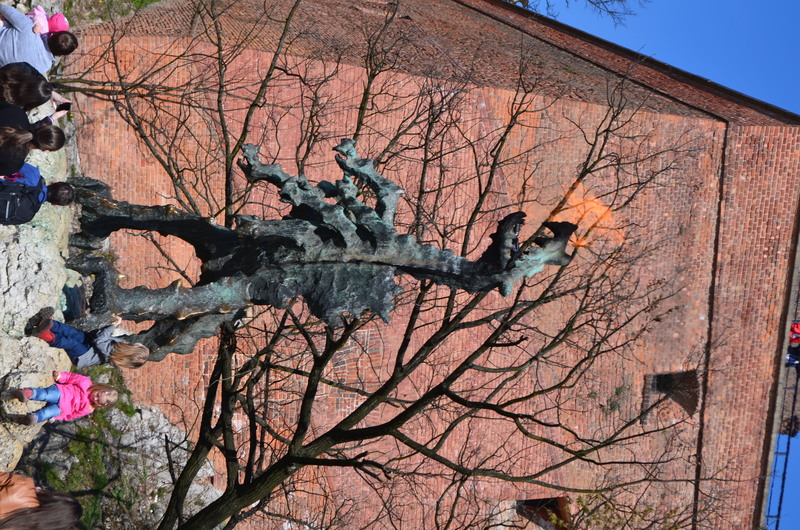 OOOOHHHH this made me want to go back to Krakow… I visited the city a while ago but I didn’t get to see the dragon nor the fiery breath… looks absolutely fantastic. I love these tales! Ah now you have to go back! I loved Krakow! Awesome story Hannah! It’s always so cool to hear about these hidden stories behind something as simple as a travel bracelet and then all of a sudden you are sent on a trail to find this amazing Krakow Dragon. Not only do you get to see more of the city, but you culminate your journey by capturing a great picture of the dragon. Always great to have a positive ending to a story that many initially would have thought was leading you on a wild goose chase! Very entertaining post! I loved Krakow too. It’s a really easy place to enjoy and have a bit of fun in especially with the mythical dragon. Love this story! And I’m so glad that you loved krakow!! It sounds like my kind of town. I can’t wait til I get there!! You will love it! It’s so amazing- I want to go back! What a fun story – now THIS is what travel is all about! love it!! Thanks Tammi- glad you enjoyed it! I always thought myths and legends are more prevalent in India… but I guess I was totally wrong …and such good stories indeed make a place special..
What a great story! Love when you come across great things by interacting with the locals! Love the Wavel Castle dragon – there was a time when you could get it to breathe fire on-demand, if you sent an SMS to a particular number, I wish I still had my old phone. What a fun story and sculpture! And very fitting for today…I just ate so much I feel like I might explode like that poor dragon. 😀 If I ever visit Krakow, I’ll definitely have to make a stop by the dragon sculpture, that looks so much fun. Looking at all the comments saying that your post made the readers want to visit Krakow, I have to say – Thank You! Poland deserves its share of visitors. Krakow is just as interesting as Prague, in my opinion. I can’t wait to show the dragon to my children!